Hydro-librium signifies the balance of water, an ironic caption depicting the not so equated water dispute between the Owens Valley and city of Los Angeles. As Los Angeles began to flourish as a result of purchasing water rights from the Owens Valley, the playa began to pay the price for the success of this new-found metropolis: Los Angeles. Water is a natural resource that serves a significant purpose in balancing our ecosystem. 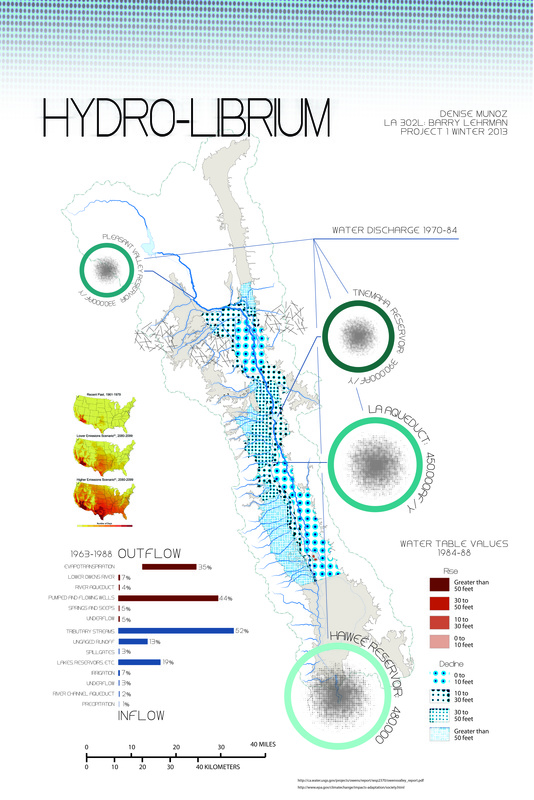 The narrative of the Owens Valley and Los Angeles water dispute, showcases a variety of disturbances within the ecology of the landscape as a result of imbalanced water use. Project one attempts to map out the impacts and benefits resulting from the construction of the LA aqueduct. The mapping (above) displays an effort to engage a temporal look at the effects of groundwater pumping in the Owens playa and compare it to observed changes in the climate of the Owens Valley basin. The research however, was not plausible enough to conclude that the results of groundwater have created adverse effects on temperature change within the basin. Alternative efforts were made to identify a connection between rising temperatures in the Owens Valley and its effects on water distribution. As temperatures increased, multiple factors began to affect the supply of water in the Owens basin: precipitation decreased, evapotranspiration increased, water demands increased, and water supply continues to decrease. A definite relationship between population growth and development can be linked to the growing demand for water and climate change, but will not be magnified for this project. Although my research deemed to be inconclusive for the main idea, the focus of the project will remain with the discussion of groundwater levels and possibly the comparison of the built versus natural basins comparing the ground water levels.